This is a guest blog post by Amy Jacobus, a nonprofit Digital Marketing and Communications consultant. Who really cares about your nonprofit's About Us Page, right? I mean, you’re probably focused more on your Services and Programs and Donate sections, right? Well, here’s what most nonprofits I work with don’t know. 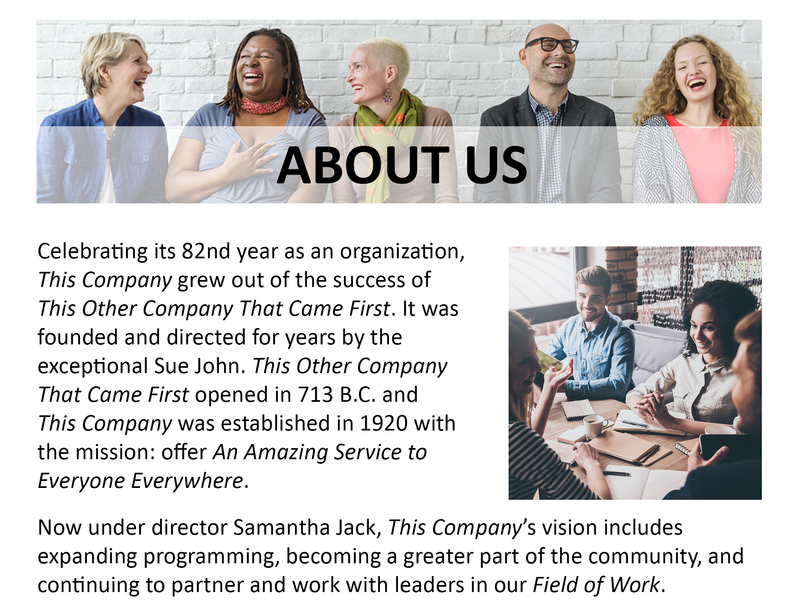 The About Us page is actually one of the top pages on your site that potential supporters visit to see how well they connect with your organization’s values on a personal level. In fact, a study by the Nielsen Norman Group found that the About Us page plays a critical role in building trust with online visitors — and we all know trust is what can lead to volunteer hours, donation money or becoming a member. If you write your About Us page with potential supporters in mind - if it beams with friendliness, personality and all-around awesomeness - it can actually inspire them to take action on your website elsewhere. And support your organization in real life! Offline! But if your About Us page is boring or filled with jargon, you’re turning people away. 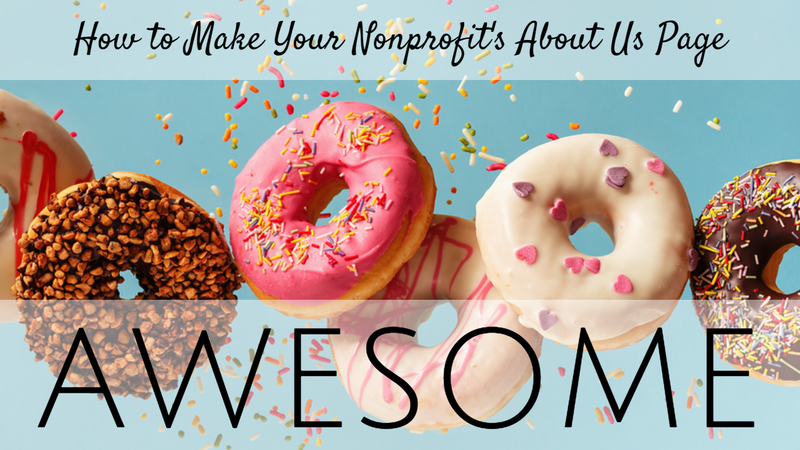 If you think your nonprofit’s About Us page (and the rest of your website copywriting) needs some work, you’ve come to the right place. I’m going to walk you through the steps to create a nonprofit About Us page that will connect with potential supporters and inspire them to join your organization. I’ll even throw in an example of an awesome About Us page to help guide you. First, let’s dissect some common About Us jargon to see what’s going on. Silly generics aside, are you starting to see the problem here? What’s Wrong With This Copywriting? The above example is a terrible introduction to your organization. Why? Because it provides too much context. Researchers find that online readers like to scan, especially because many of us are now taking in what you have to say on a small screen, aka our phones. If your copy isn’t broken up into shorter sentences or bullet points or headers and sub-headers, it’s going to be much more difficult to read on mobile. And with our dwindling attention spans and high-speed scrolling tendencies, you’ve lost us. Is everything I wrote here essential? How can I cut down the length of this section? The above example lists no less than three directors The Company has had in its lifetime. Why, exactly? Isn’t the current director the relevant info here? If history is a big part of your organization’s identity, can that be framed and expanded upon elsewhere on the site? If you still find yourself writing down a whole lot of dates and names, how about switching mediums? Could you better illustrate your point by creating a more visually interesting timeline, with graphics and media and animation, rather than writing a rather dull paragraph? Nonprofits (and some forward-thinking social good for-profits, too!) have big missions to bear out in their work. I love this field, because I love a good, lofty dream to make the world a better place. There’s a surprisingly large number of ways to write that you are growing the company to expand your reach – without saying how that reach will benefit others. Or that you are getting involved in your local community – without saying exactly how you’re approaching that with grace and respect and commitment. Or that you’re working with other impressive and important people and companies to make it all happen – without saying why we, the readers, should care. Really, a surprising number of ways to say virtually nothing meaningful. I would be impressed if I wasn’t so disappointed. The lack of specificity is a real killer for your About copy, because it doesn’t convey how you and your uniquely-qualified, awesome organization stand out from the crowd of other companies vying for your audience’s attention, commitment and donations! We are expanding programming, becoming a greater part of the community, and continuing to partner and work with leaders in our Field of Work. If you rewrite this description with the focus on how it will actually benefit those it aims to serve, you’re going to make a bigger impact on that reader, guaranteed. 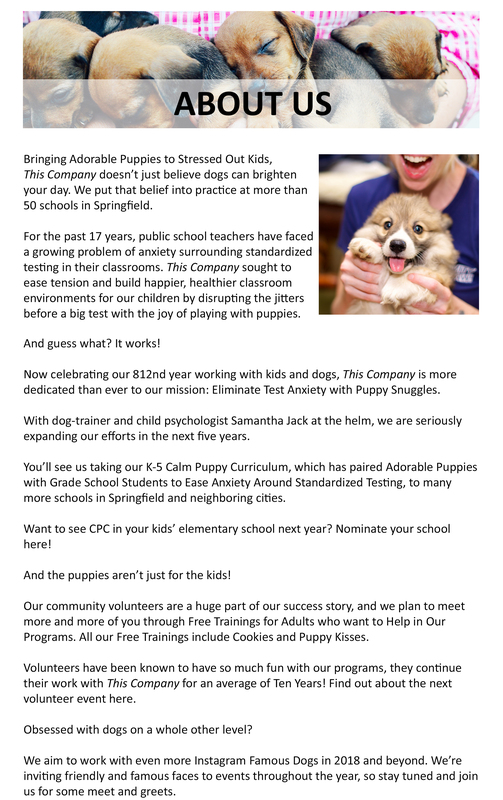 We are expanding our K-5 Calm Puppy Curriculum, which has paired Adorable Puppies with Grade School Students to Ease Anxiety Around Standardized Testing. We are also taking steps to Cultivate More Community Volunteers by bringing Adorable Puppies to Neighborhood Parks and holding Free Trainings for Adults who want to Help in Our Programs. All our Free Trainings include Cookies and Puppy Kisses and volunteers have been known to have so much fun, they continue their work with This Company for an average of Ten Years! We aim to work with even more Instagram Famous Dogs in 2018 and beyond, inviting friendly and famous faces to events throughout the year. But Amy, That Copy Is WAAAAYY Longer Than the Two Boring Paragraphs You Shared at the Beginning of This Blog Post! Yes, I know. But isn’t it easier to read and more relevant and inspiring? I am grateful every day to strategize, market and write for companies that serve communities in need, inspire people daily, and give generously in pursuit of a better world. If this blog post encourages just one organization to rethink its current copywriting – geared more toward foundations and Boards – and instead use language to motivate readers and spark involvement, I really think the world will be a little better still. Amy Jacobus is the Founder of Amy Jacobus Marketing, a Digital Marketing and Communications agency for nonprofits, creatives, artists, and small businesses. She is a trained dancer and journalist, and runs her company out of Brooklyn, with plenty of black coffee in hand. Send her a hello - @amyjacobus!